This is a stunning, 6.5" diamond bracelet weighing 10.05 DWT and containing thirty diamonds of SI-1 clarity, comprising a whopping 5.5 carats of diamonds, of which 3 cts (.15ct ea) are SI-1 clarity, H color, and another ten diamonds totaling 2.5 carats (.25ct ea) which are SI-1 blue-green. 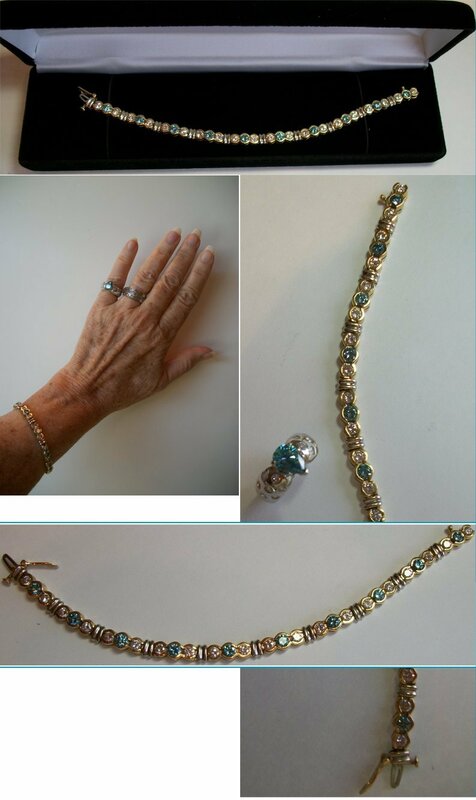 The 2005 appraisal for this bracelet reads as follows; "Ladies 14k two tone gold diamond bracelet. The bracelet contains ten links separated by a whiite gold bar. There are two white diamonds per link and on[e] irradiated bluish green diamonds per link. All the diamonds are set in half moon bezels. There are twenty round brilliant cut diamonds being 3.00ct H in color and SI1 in clarity. There are ten irradiated round diamond being 2.5ct SI1 in clarity." NOTE: We have displayed this stunning bracelet adjacent to an item from this same estate, a 14k white gold ring which ALSO features a combination of both blue-green and white diamonds. The ring, featuring a 1.50 carat pear shape blue-green diamond flanked by another .70cttw of white diamonds, beautifully compliments this bracelet. Please see our other listings for ring details.